I am a little annoyed by SEO today. A lesser quality app than ParkControl and incorrect guidance are found in search results. They bring the user to a tool that does a brute-force search of the registry to change the applicable CPU power subsystem options, and then often mandate a reboot afterwards. Any site with fake ‘download button’ ads I do *not* call freeware. I mean, if I am to be strict in my classification for not being 100% free, then I will impose that same restriction on others. Who knows the true cost of said ‘freeware’, given the deceptive downloads served. This can not only cause semi-permanent ‘damage’ to your registry, but is just the wrong way to do it. I am not saying the author has bad intentions, but it is certainly no more free than ParkControl (the top of the page has a big fake ‘download’ ad – you know the type – goodness knows what it serves up). Any site with fake ‘download button’ ads I do *not* call freeware. I mean, if I am to be strict in my naming for not being 100% free, then I will impose that same restriction on others. Who knows the true cost of said ‘freeware’, given the deceptive downloads served. Use ParkControl – no reboots, no manual registry hacks. Easily edit multiple power plans. And with Bitsum Dynamic Boost and Bitsum Highest Performance, you can maximize performance in a click. Not to mention the useful diagnostic feature of showing power plan change activity (by any process in Win10+). 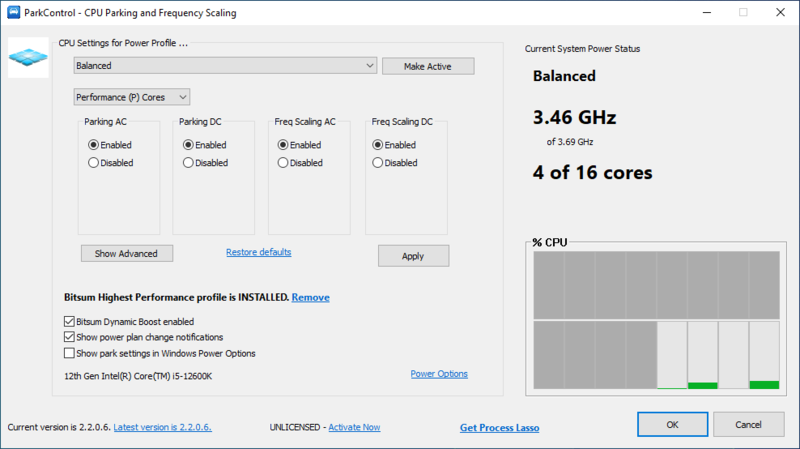 Certainly you need not buy *anything* [to use ParkControl for] tweaking CPU core parking, unhiding these settings in the Windows power options, or other basic operations. ParkControl is Free, except for the Pro features (some mentioned above). Certainly you need not buy *anything* to tweak CPU core parking, unhide these settings in the Windows power options, or other basic operations. Don’t go underboard and use a lesser utility. It’s just a pet peeve. Now, if the utility in question was superior to ParkControl, I’d say – have at it. But it’s just a hobby project, and we’re here full time to cover this, have been for a long time. This not to mention the real-time display found in ParkControl, which is rather useful. It’s far easier to see parked cores in our display than Windows. What can you do? Well, you vote in your clicks my friends. Please, I appeal to your rationality. Choose wisely!